‘I think that my dog has swallowed a U.F.O.’, the man told me, in obvious distress. There are many abbreviations in the veterinary world, but U.F.O. is not associated with any disease condition. As far as I was aware, U.F.O’s were Unidentified Flying Objects, commonly known as space ships or flying saucers. The man with the dog seemed to be very serious about his problem, so I questioned him further. It turned out that his dog had been vomiting for two days. He was concerned that his dog might have swallowed a child’s toy, and that this might now have become lodged in the intestines. ‘You mean you feel your dog may have swallowed a Foreign Body?’, I asked him. ‘Yes, that’s right – a U.F.O. My last dog had the same problem after swallowing a stone’, he replied. After sorting out the terminology miscommunication, the situation was much more straightforward. A foreign body (often abbreviated to F.B.) is the term used to describe any external object which enters the body. A foreign body may be a grass seed lodged inside an ear, a piece of glass which has penetrated a dog’s paw, or even a peanut which has been inhaled into the lungs. However, the most common foreign bodies in the animal world are ingested foreign bodies – i.e. objects which are swallowed, and which may become lodged in the stomach or intestines, causing an obstruction. Ingested foreign bodies are uncommon in cats, because they have fastidious eating habits. 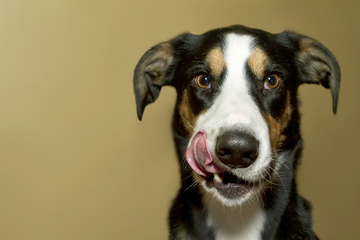 Dogs have indiscriminate appetites, and will often hungrily swallow anything which seems even only vaguely edible. They also enjoy chewing, and they may accidentally swallow smaller pieces which break off a larger object. The gullet of a dog is very distensible, and it is possible for dogs to swallow remarkably large objects. Domestic dogs have descended from wild dogs which survived by eating carrion. In the past, it was very important that they were able to gulp down large amounts of meat, skin and bones very rapidly. Modern dogs retain this ability, but it does cause periodic problems. I once saw an X-ray of a Yorkshire Terrier which had swallowed a bone which was about six inches long. The bone was almost half the length of the dog. Any object from golf ball diameter upwards can cause problems in an average collie-sized dog. Smaller objects can cause obstructions in smaller dogs. Certain objects seem to cause more problems than others. Fruit pips (e.g. peach stones), Corn-on-the-Cob cores, rubber balls, stones and pieces of bone commonly cause obstructions. 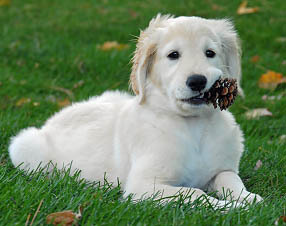 Baby soothers are a common cause of intestinal obstruction in puppies, who seem to enjoy chewing them. There is a very long list of ‘sporadic foreign bodies’, including engagement rings, false teeth and bath plugs! A foreign body which is causing an obstruction of the digestive tract causes specific symptoms, nearly always including vomiting and dullness. When the vet feels the abdomen, sometimes the hard object can be palpated. More frequently, an X-ray may be taken, and the object may be seen in the stomach or intestines. Some foreign bodies are not visible on X-ray, which makes the diagnosis more complicated. In these cases, the vet will look for more subtle signs on the X-ray, such as abnormal accumulations of gas. Surgery to remove the foreign body is usually necessary. This type of operation can be complicated and difficult, because there is often considerable damage to the intestines at the site where the object was lodged. However, most dogs cope well with this type of operation, and after a few days of intensive care in the veterinary hospital, they go home to live normal lives again. "Excellent article! My friends recently went throug"
"Very cool post! I visit your site fairly often and"
"Great post. I am facing a couple of these difficul"
Sign up for our weekly newsletter and join thousands of dog owners getting treats for them and their dog.